OK, this wasn’t exactly during the rainstorm but right before it. My husband took it on his way to pick me up. Thursday the rain pelted us pretty hard. I left work and had to run across what appeared to be a newly made and unauthorized mini-canal in the parking lot. The water rolled over my shoes. We have days like that in the early summer. Clear, then suddenly the sky grows dark and the clouds empty several inches of rain in a short time. I guess we’re not unique in that. All of the places I’ve lived have had that same type of weather during the spring and early summer. What is unique to me here is the sky. It’s huge. I mean, I know that Montana is nicknamed “Big Sky Country,” but Nebraska could also be called that. I noticed it during my first visit with my family when I was a teenager, and I notice it quite often now that I live here. On days like yesterday, I step outside at work, where there are really no significant trees for miles, and I can feel the sky looming above me. The sky just feels bigger here than it did in the other places I’ve lived, and I just feel smaller. I can almost imagine being above myself and seeing people scurrying around doing their thing below, oblivious to the fact that the whole of creation sweeps above and around them. 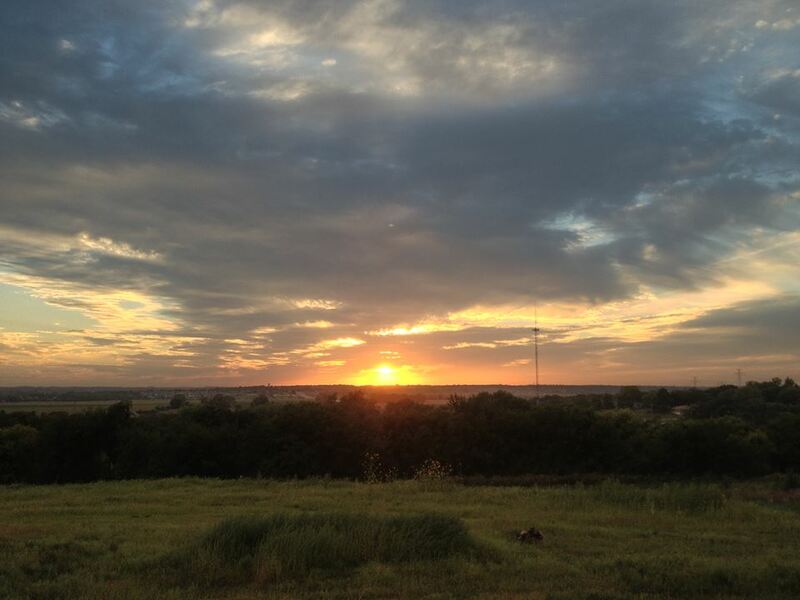 Did I mention that the sunsets are gorgeous, too? I can’t really figure out why the sky seems bigger here. Is it because there are fewer trees and buildings and steep hills (although there are plenty of dune-shaped hills) where I notice it? I don’t feel it as much in my neighborhood, where mature trees line the streets, but get a few blocks away, where fields surround the highways, and there it is: Big Sky. Or maybe it’s because the clouds pass overhead at a higher altitude, giving the sense of space above. Or maybe the air is clearer or there’s less low, dense cloud cover. Maybe a combination of those things. Who knows? It must be raining out there, on the horizon somewhere. After I got home from work yesterday, the rain stopped. My kids and I took advantage of the break in the rain and drove to the store. 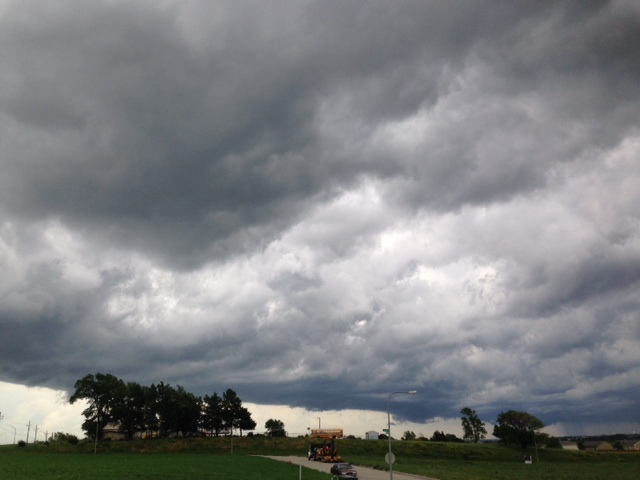 On the way, I noticed wildly interesting clouds forming above us. Huge clouds. Mountainous clouds, some heavy and ominous, and some swirling in formations like I’d never seen before. Of course, I had to stop and take some pictures of them. And mind you, I was not alone. One other car had pulled over to photograph the natural wonder taking place above us. Maybe the passengers in that car are newish here, too. Look at those clouds! All this and not even a thunderstorm warning. 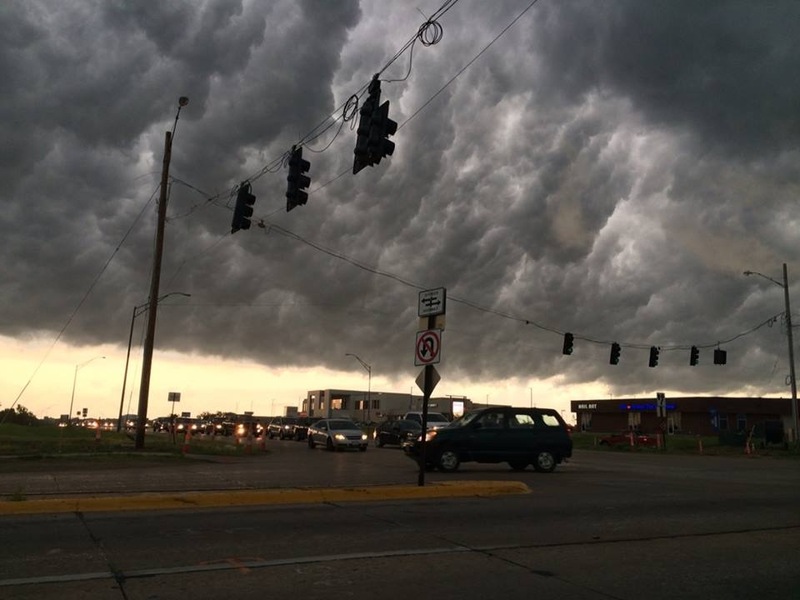 Almost looks like a blanket being pulled up over the town. I noticed a few things about what was going on around us. Besides that other driver and me, nobody seemed to notice the show happening above us. The clouds changed minute by minute, and everyone just drove around, going to the store, taking the kids to softball practice, driving home from work. Nobody seemed impressed. I also do that plenty of times, and, realistically speaking, I can’t stop every time something interesting goes on around me or I’d never get anywhere. But what happened to the sense of connectedness to nature and feeling of awe I had when I was younger? When did I stop noticing things like a giant cloud formation sailing above me? I also realized that artists have attempted to paint, describe, and compose replications of such natural phenomenon for centuries and that, in reality, I’ve probably spent more time looking at the human attempts to replicate that sky than the sky itself. Mostly nature doesn’t catch my eye unless it results in something super-impressive, like a storm rolling in. “I feel the thunder in the sky. A double rainbow! 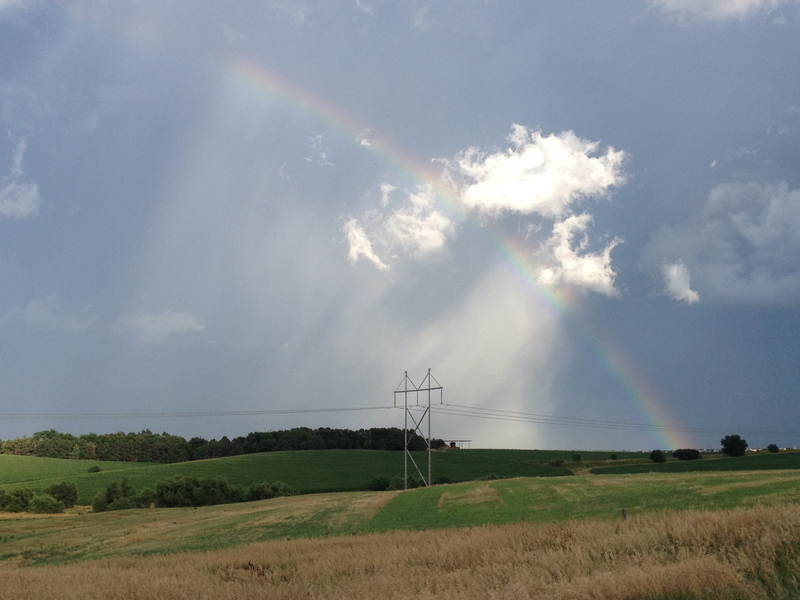 The perfect ending to the rainstorm. Just a little chilly. Maybe put on a light jacket. 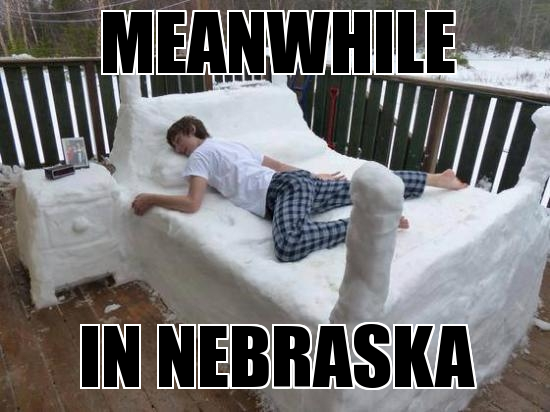 Before we moved to Nebraska, people said things like, “You’re gonna freeze out there. It’s practically the tundra.” I read books like My Antonia where the endless Nebraska winters produced suicidal tendencies in settlers living in dugouts. Even cashiers in grocery stores and people in our new neighborhood, upon finding out that we had arrived in June, said things like, “Oooh! 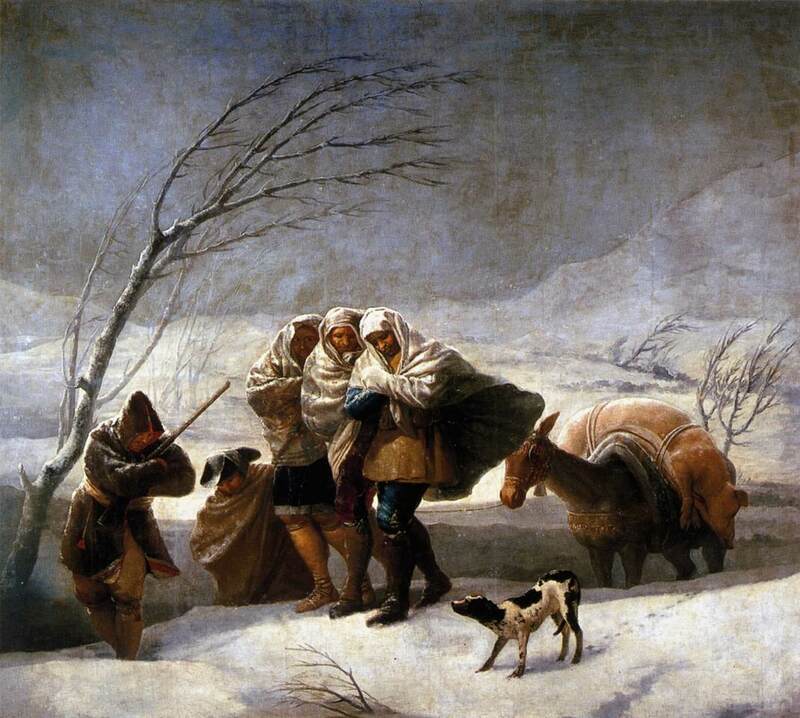 You haven’t lived through a winter here yet.” I began to wonder if we had moved ourselves to Siberia on accident. Prettymuch what we expected before we moved here. It turned out to be more like what Cincinnati got after we left! Then the winter hit, and it was cold. Temperatures reached down into the -20’s with wind chill factors in the -30’s. But guess what? Back in Cincinnati, our friends had the same kind of cold with one additional fun thing: lots and lots of snow. Like, many-snow-days-of-cancelled-school snow. Our kids pouted as they trudged to school day after day with only one cancellation the entire winter. We had very little snow here. I couldn’t help but smile when remembering the warnings about moving somewhere so violently freezing. Around the end of April something interesting happened. It got warm. Really nice and really sunny and really warm, and the grass actually started getting green. Spring! By now, it’s summer, and we are experiencing the beginning of hot weather. Last summer it got up to around 105 or so, and I expect the same this year. Summer view of the area around the college where I work. Winter view of almost the same spot. Note the side mirror in the picture…no way I was leaving the car for this one! Maybe this is a Midwest thing. Maybe we’re so used to the extremes in weather that we just accept them. We complain about them, but we accept them. Then when they leave, we enjoy the new season. I know that some people love living in places where it’s warm all of the time, and I can definitely understand that. However, a big part of me thinks that the change of seasons is a gift. Right about the time I’m sick to death of hot weather and think I won’t be able to stand walking from a nice, air-conditioned house into the near-jungle humidity that is the Midwest summer, fall hits and cooler temperatures bring a sweet relief. When winter drags on and the darkness feels oppressive and the gray colors drab and I think I’ll be able to double-wrap my house in all of the crocheted items I’ve been creating all season to medicate my winter brain, spring comes, and I forget about winter. 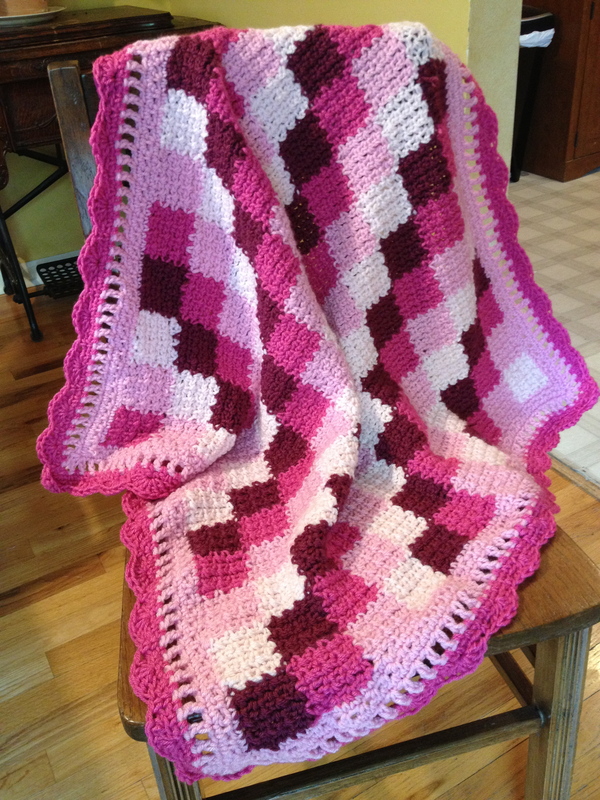 One of those crocheted items I created to keep my fingers from freezing in the winter weather. Yes, I may be showing off just a little. 1. If you are the first to stop bundling up and start wearing regular clothes in public, everyone thinks you lost weight over the winter. 2. When you survive something that was difficult and long, you remember it, but you also sorta forget it. That spring, my friend and I were talking about whether we’d ever get married and lamenting the singleness that was our life at the time. I remember saying, “It’ll happen someday if it’s supposed to, and when it does the single times will be like last winter. We’ll remember them, but when the spring comes, they’ll seem like the distant past!” That goes for more than just singleness (and, let’s face it, some seasons of married life make the winter of my singleness look pretty good!). I’ve found that to be true for the Winter of My Children’s Babyhoods, and the Winter of Difficult Job Situations, and the Winter of Stressful Family Times. When those times subside and the spring hits, the intense emotions of the winter fade. Just as the pain of childbirth seems less after the baby is born (well, so we mothers claim! 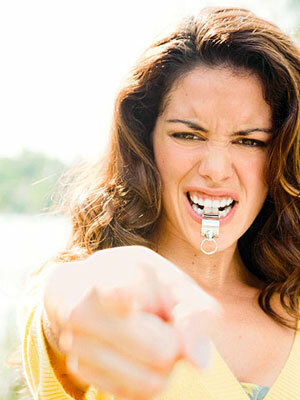 ), the cold of winter and the pain of difficult times lessen when spring or resolution hit. 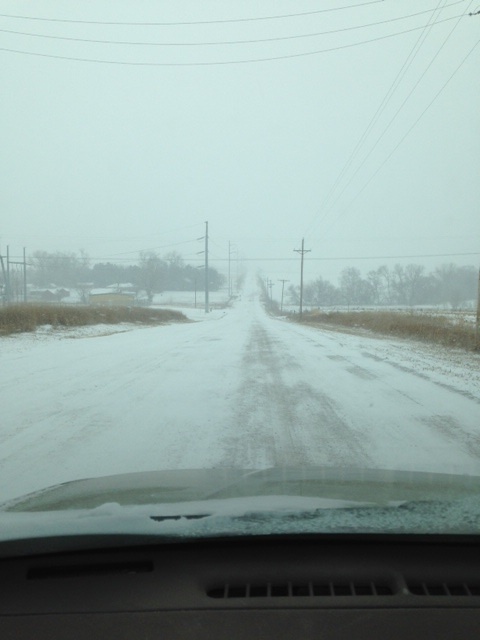 The gravel road leading to the college did get a little snowy. At least it kept the dust in place! Don’t get me wrong here. I’m not saying that surviving hard times doesn’t require work. Sometimes getting through the winter requires resourcefulness, ingenuity, and downright toil! When the bulk of the work is done, though, and the light of spring starts to show through the cloudy, gray winter, and when the moment comes when I can stop and look out the window and finally take a deep breath, I realize I don’t remember winter the way I thought I would. I write this because I need a reminder to enjoy today while I have it and not to stress out over the difficult things. I write this as a reminder to myself that if I focus on what’s good today, someday the bad things will seem like one of those distant winter memories. “Eh, it’s not so bad after all.” I write this so that this summer, when it’s 110 degrees and spending even three minutes outside threatens to turn me into a burnt ember, I will remember that soon all of the heat will be a memory, and the cool temperatures will rescue me! Bright, colorful, sugary, savory: what’s not to love? A few days ago, my husband and I spent a fun evening eating whatever junk food we wanted, and we didn’t even have to share it with our kids! This fun date night was made possible by a joint effort between our church and our town. 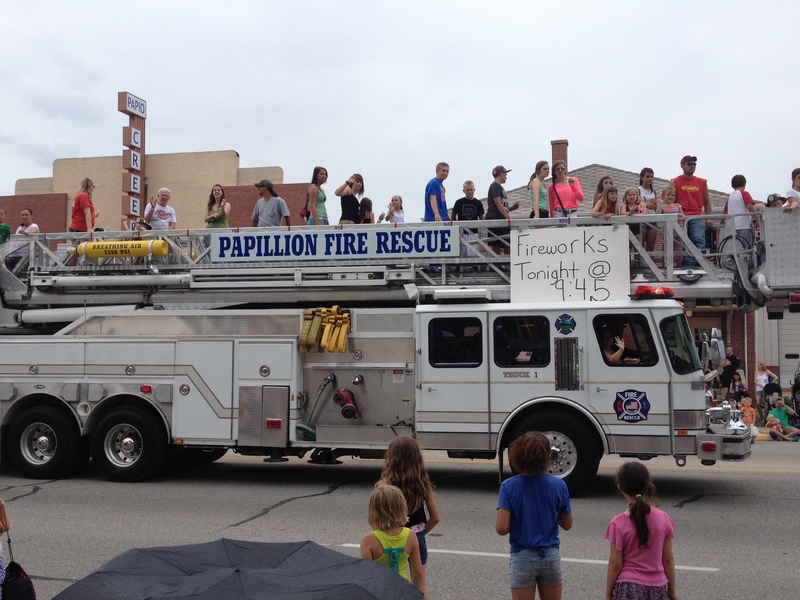 The leaders of neither knew when they scheduled Vacation Bible School and Papillion Days the same week that they were contributing to a fun night out for at least one tired couple, but this year they did just that. 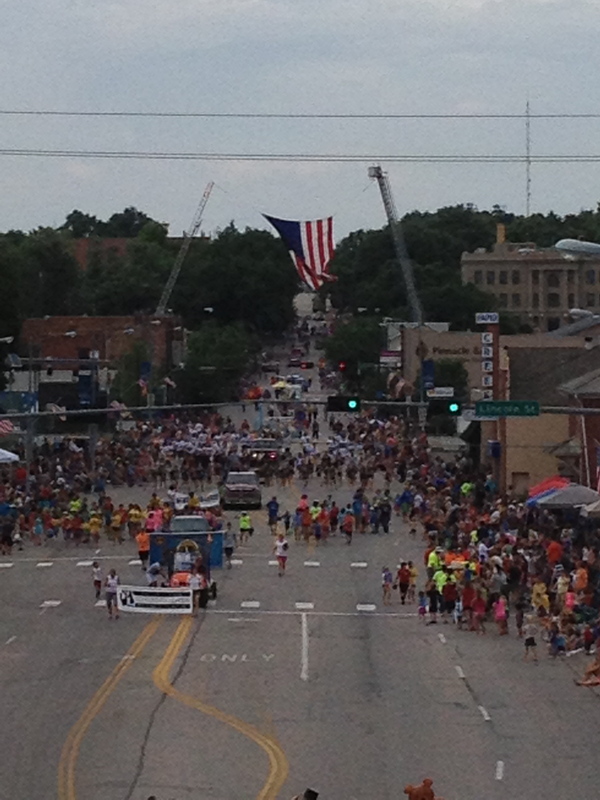 The festival our town holds every year is one of the first things we attended here when we moved to Nebraska, and it helped create some of our best memories of our year. 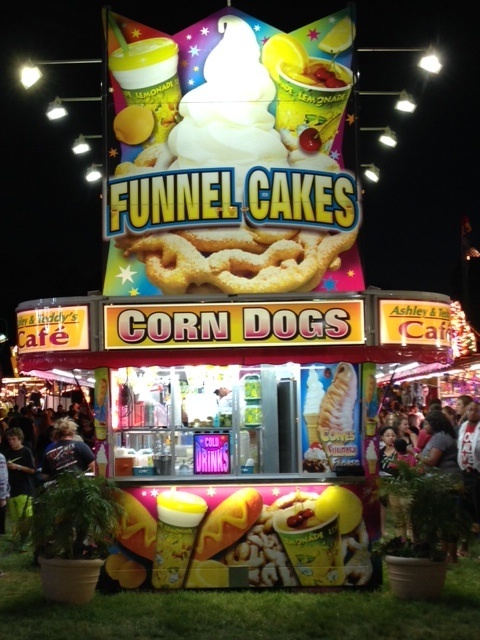 Here are five things I think are great about a small town festival. 1. Family legends are made. 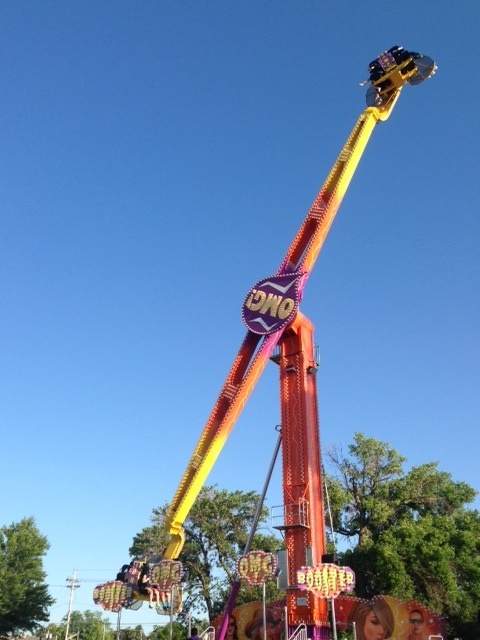 Last year, my then ten-year-old son and I rode the scariest and most ridiculous ride ever created. 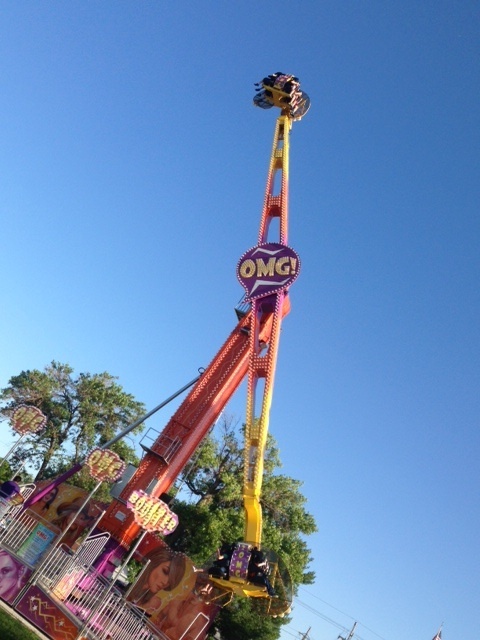 Everyone else in the family cowered at the enormity of it, but we looked at each other and said, “We will brave the ride known as OMG.” And we did. Oh, what’s that happening? The bar turns circles in the air? And the people dangling on the ends of it also spin? That’s a recipe for motion sickness for sure. All the way around. Yes, indeed. I must admit I screamed. Quite a bit. 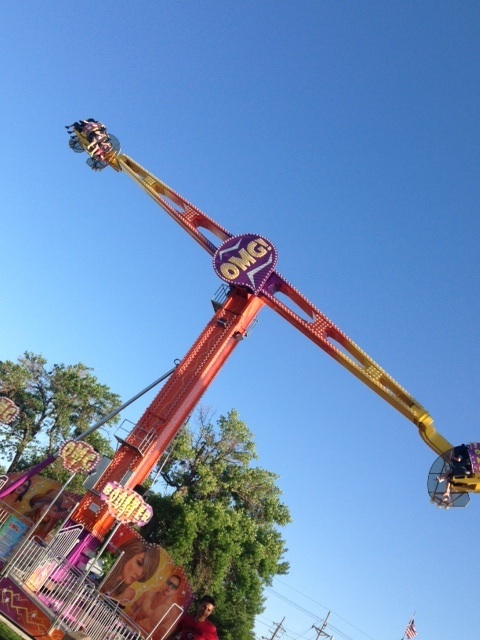 But in my own defense, I was much, much more afraid that my iphone would slip from my back pocket and smash to the ground in a million beautiful, high-tech pieces than I was of the ride. If we ever brave the OMG again, the iphone will remain safely in my husband’s pocket! 2. All the junk food you can afford. 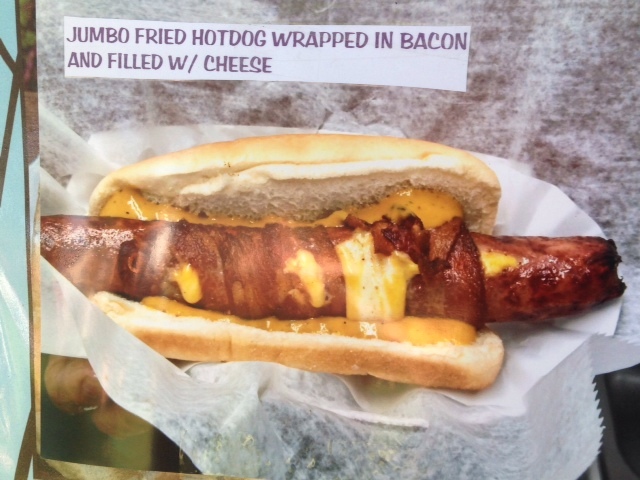 Where else can you get a fried hot dog wrapped in bacon and stuffed with cheese? Who even knew these existed? I’m a little sorry I didn’t try it, although it probably contained enough cholesterol to clog even the cleanest arteries. I don’t know if I should eat it or use it to oil the squeaky hinges in my house. 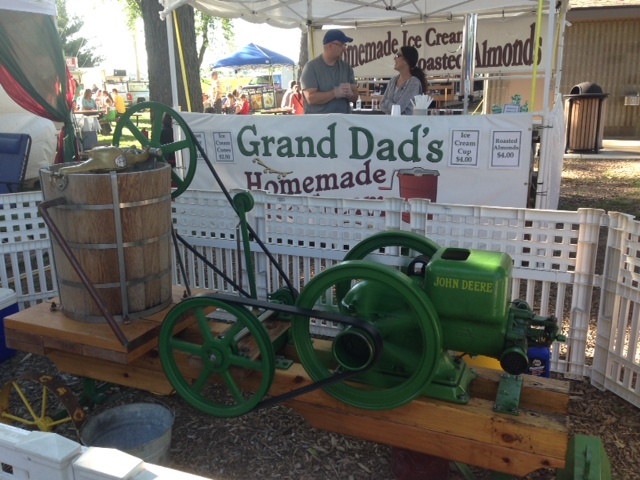 And who can resist Grand Dad’s Homemade Ice Cream? 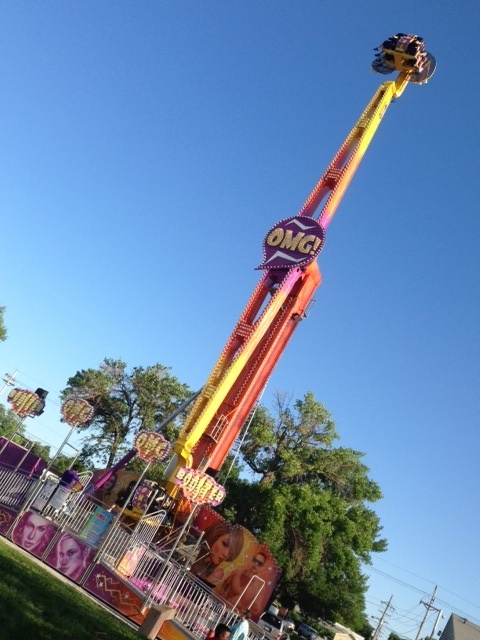 That brings back childhood memories of the county fair . Yum! Why are these things always powered by John Deere engines? There must be a story there somewhere. 3. Nice people, and usually a few that you know. Hey, it’s a small town, right? So you’re bound to run into someone you know. For me it was a woman who might or might not have been the mother of one of my daughter’s friends. I saw her. She looked familiar. I thought maybe it was my daughter’s friend’s mom. I smiled. She smiled back. She looked like maybe she recognized me. I had that moment of should I or shouldn’t I say hi. I didn’t know her name, and, sadly, I don’t even remember her daughter’s name. I walked past and whispered to my husband that I felt bad for not talking to her if she is, in fact, someone I’m supposed to know. He said, “Well, she should feel bad, too, because she didn’t talk to you either.” Classic man answer, but a pretty good one. I don’t have a picture of her for obvious reasons. That would have added the adjective “creepy” to the list of “rude” and “snobby” she was already silently using to describe me. 4. Lots of cool junk nobody wears anywhere else. Did you ever notice that when they set up booths selling clothes or jewelry at these things they display an awful lot of Native American dream catcher-y kinds of stuff. And those flowy, tie died, lacy, scarfy type dresses always hang in a couple of booths. Do they sell a lot of that? They must. Do people actually wear that stuff? Not sure about that. They did in 1990. 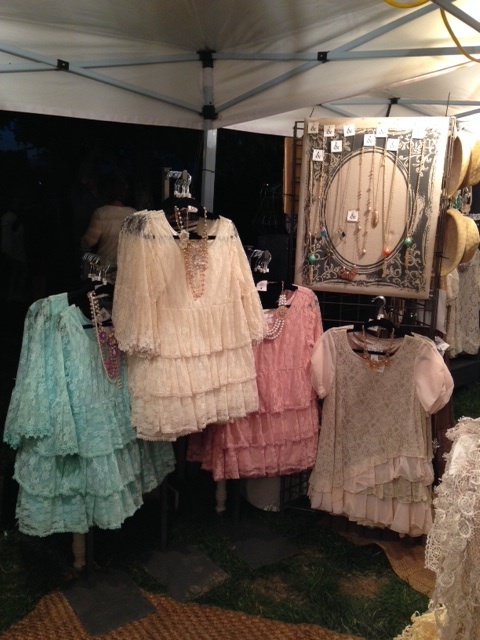 I’m afraid if I put on one of these whispy lace blouses, I might just float away. Like a ghost or something. 5. A parade the likes of which my 1950’s-loving relatives would have been proud. Just take a look at this gigantic American flag followed by old men in tiny cars, fire trucks, marching bands, and clowns throwing candy. I didn’t know places still did this sort of thing. White fire trucks! Oh, and there are fireworks. Forgot to include that in my list of great things about festivals! 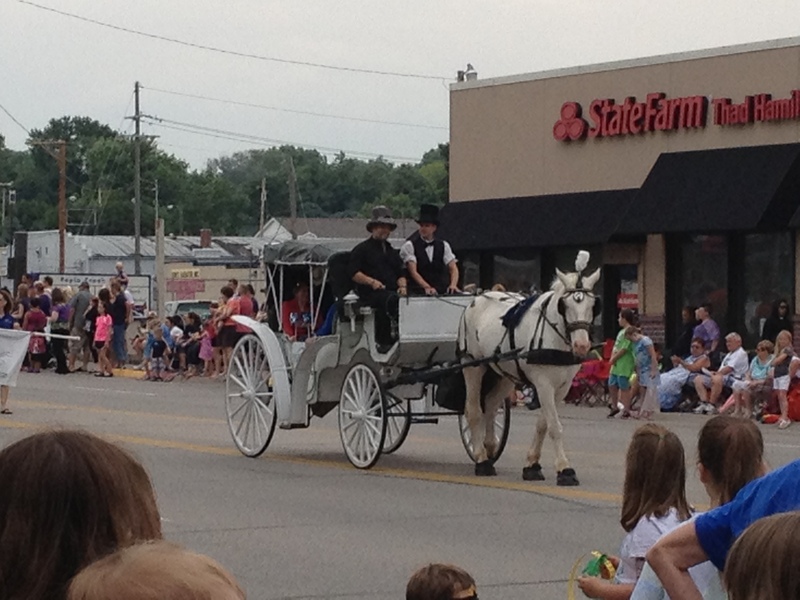 Don’t forget the white horse and carriage to go with the white fire truck. All of this goes on every June. All of it is within walking distance of our front door. Small enough that we walked to the festival, walked around the entire thing to scout out where to bring the kids this weekend, bought a sandwich and two very good lemonades, and walked home, all within the two hours we had before VBS ended. Seems like a pretty good deal to me! One year ago tonight, we slept in a hotel in Hannibal, Missouri. 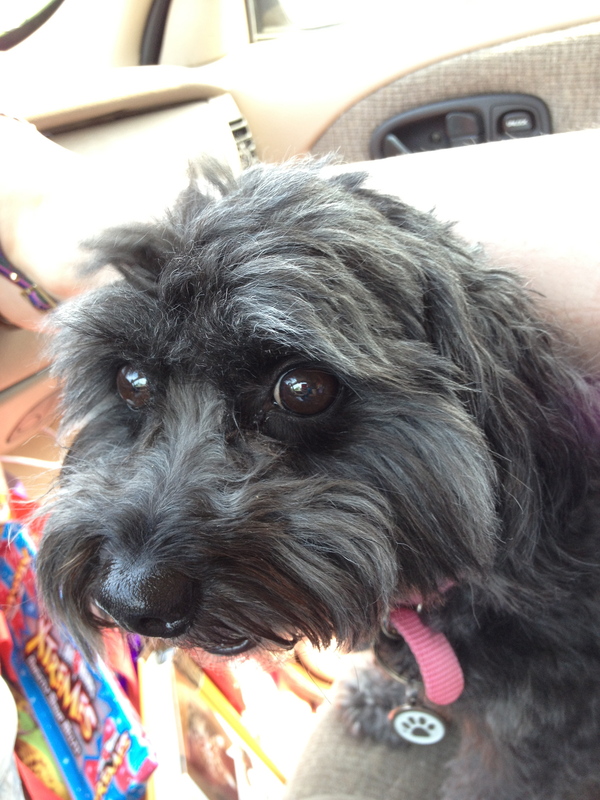 We smuggled our dog in, although this will remain our secret since I’m pretty sure they had a no pets rule. We had her with us because we had everything we owned with us. One year ago today, we packed up everything and headed west. 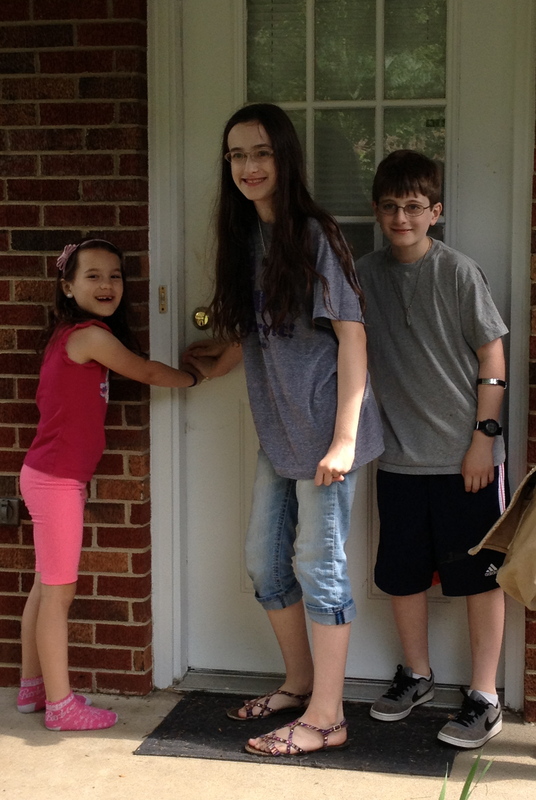 The kids stopped for one last picture as they closed the door on our old house. My oldest girl and I drove the car. The un-air-conditioned car. She held the dog on her lap. 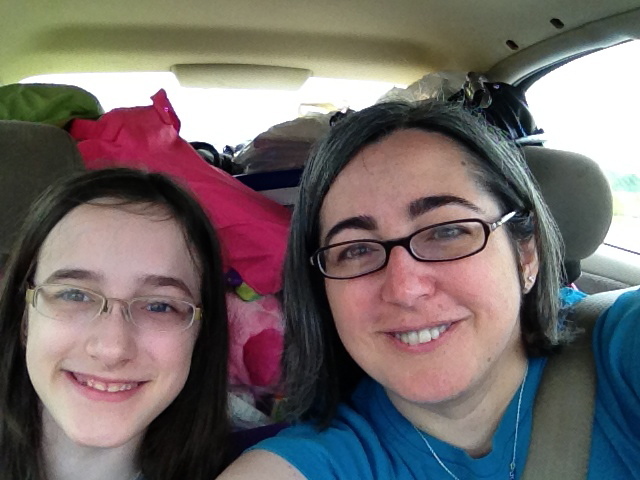 I chose to drive the car because I didn’t like the alternative: our 12-passenger van. 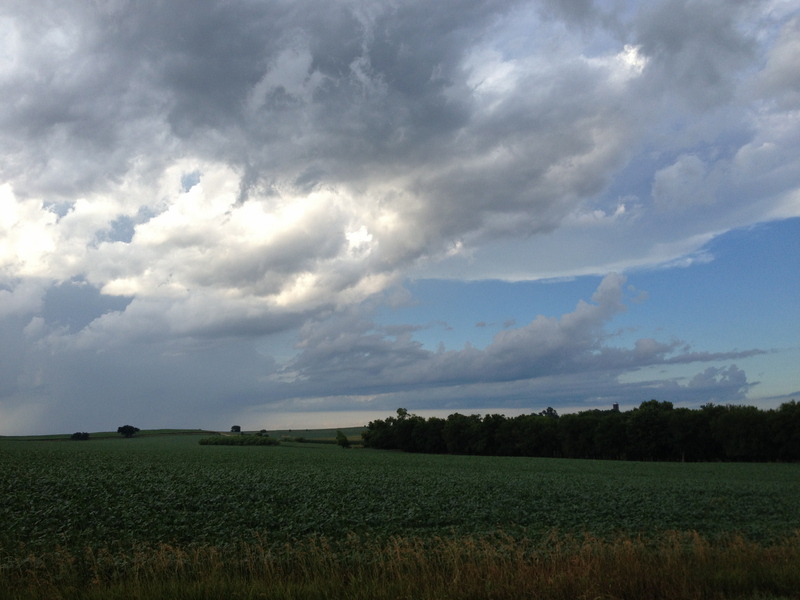 The weather people predicted thunderstorms and lots of rain, and the thought of navigating that enormous thing over the prairie with all of our most important earthly belongings packed tightly around our invaluable children in the back pushed me to choose the car. Of course, the only rain came on the very last leg of the trip, when our son had just guilted me into driving the van so he could see me for a while, but we all survived anyway. The little one brought her hermit crab, so in the back of my mind I worried that a small Rubbermaid container would not be enough room, that the hermit crab that had lived three or more years would die on the trip and what would become of my child’s emotional health during a big move when she’d already left everything behind?! Of course, it lived until a few months ago and she remained emotionally healthy, but that’s a story for another day. 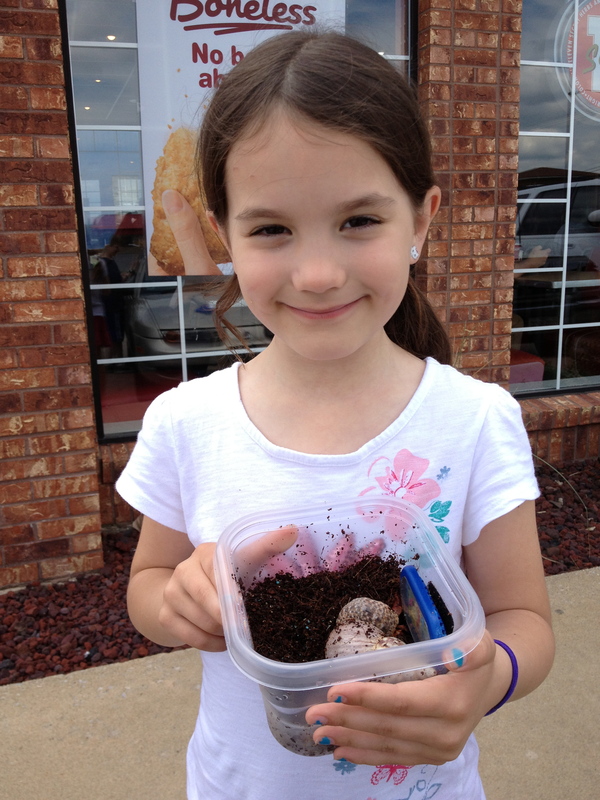 This is our youngest with Missus, her hermit crab. Gracie behaved herself very well. I’m sure her fur made her pretty uncomfortable, but she and my daughter made the trip without much complaining. 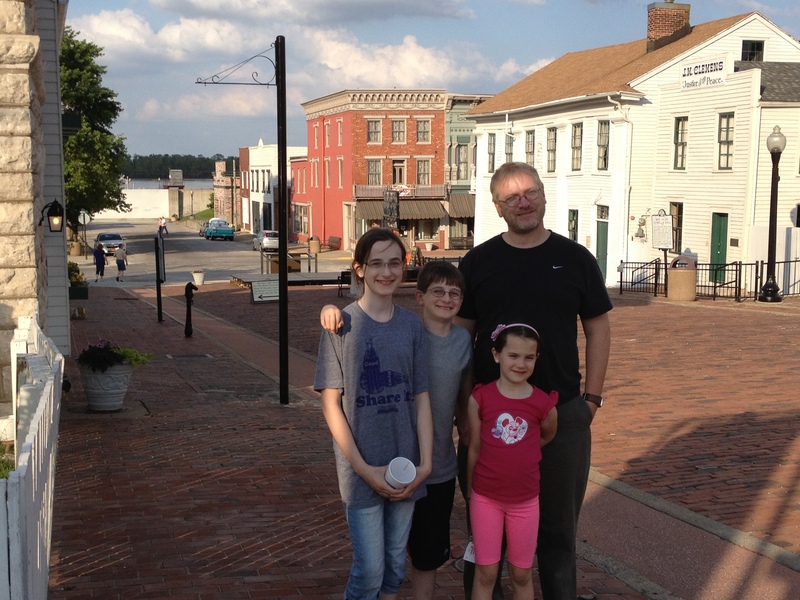 So, anyway, we stopped in Hannibal just so we could see Mark Twain’s boyhood home, and it did not disappoint. We had dinner in a quaint little restaurant and walked down to the river. The town has fixed up the riverfront to look like it did when Mark Twain lived there, and if you visit during regular business hours (which we didn’t), you can tour some of the homes. We settled for looking at them from the sidewalk. It was extremely sunny. We had trouble finding a spot to take a picture because the sun was apparently burning everyone’s eyeballs, turning them to small spheres of char, and, therefore, blinding them. At least that’s what they claimed. Yep. He’s a stranger to hard work. 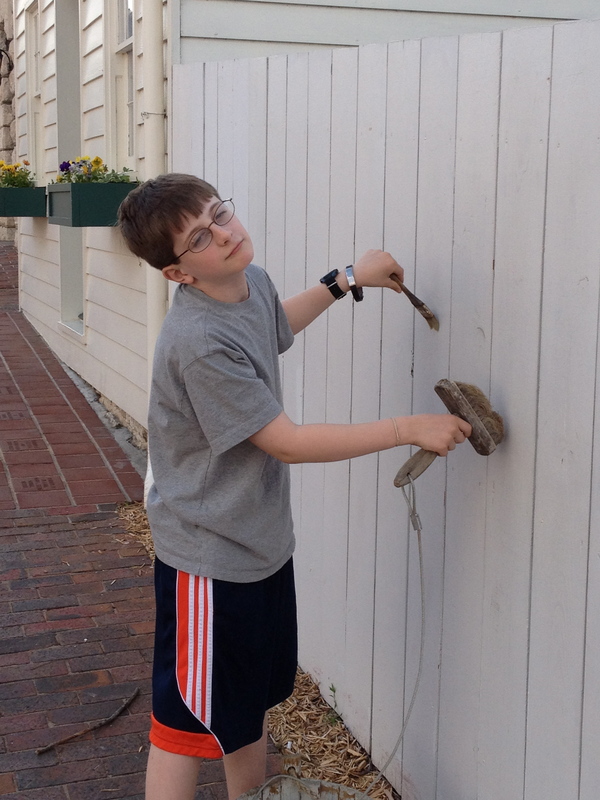 We took the obligatory tourist picture of our boy acting out the famous paint-the-fence scene from Tom Sawyer. We got up the next morning and drove the rest of the way to our new home. We rolled into town around dinner time. 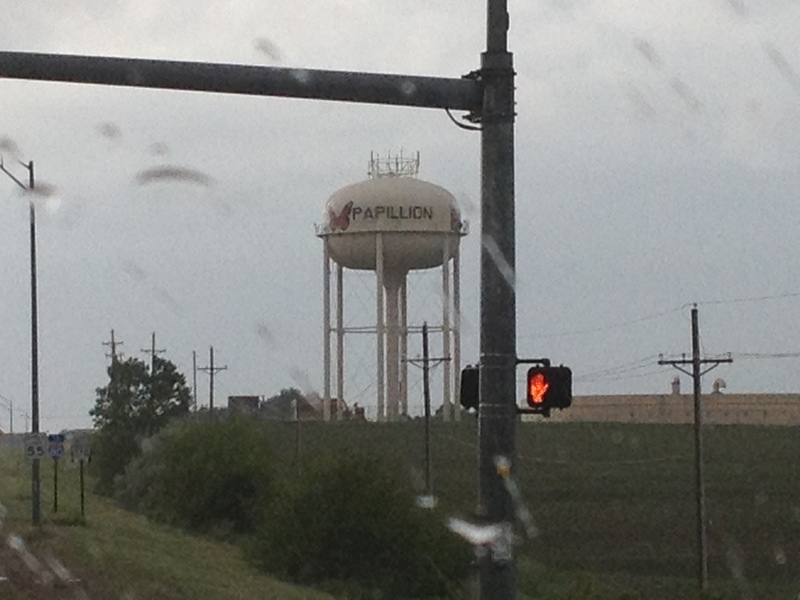 I snapped a photo of the water tower in town as we drove by. I pass this every day on my way to work, and I almost always think of that first day here. Especially on rainy spring days when the green fields contrast with the purplish blue sky. You can’t see it in this picture, but the colors stand out so beautifully on days like that. Don’t judge. We were at a stop light when I took this. We didn’t have a home yet, although we would in a few days. My family, along with the dog, spent the weekend in the dorms at the college, where I’m pretty sure they had a no pets rule too, and one of the very first things I did after settling our stuff in was take my daughter to buy a cage for that hermit crab! Although my husband and I moved a few times before the children were born, including a move to and Ukraine and back, we had never moved with children. I didn’t know what to expect, how they would adjust, if the move would traumatize them in some way. Not only did I wonder how the children would adjust, but I also wondered how I would do. I left behind friends and a support network, a place I had struggled for about a decade to feel like I belonged before I finally found my niche. 1. Wherever we go, there we are. We don’t leave ourselves behind, which means we bring all of our baggage with us when we move. Real change takes more than just a change of location. We can’t expect that everything that we hated in the old place will just disappear when we move. For example, I hoped that leaving a job in the mall with daily access to a food court and unlimited refills of every soft drink imaginable would help me improve my dietary habits and lose weight. Not true. I found that my new job boasted a pretty great cafeteria where I could eat lunch AND breakfast, and for a small fee could get as much Mt. Dew as my tummy could hold. 2. Sometimes taking one step to change something really does change a lot of things. Seems contrary to number one, and maybe it is. Sometimes I am afraid to change things in my life. I prefer the known to the unknown, so I just stay in whatever mess I’ve made. Taking one step in a positive direction gives me a different perspective and encourages more positive change. 3. The negative scenarios usually don’t happen. I worried that the kids wouldn’t like their new school, for example. I thought maybe it would take a long time for them to adjust to being somewhere new. That was unfounded, though. The principal told me a few months ago, “We love your children! They fit right in at the very beginning. I forget that they haven’t gone here all along!” The feeling is mutual with the children. When I ask them what they like most about living here, they say that they like the school and the people in it the best. 4. We have to let go of some things to get other things. And its corollary: We don’t need half of the junk we keep around. This applies literally and figuratively. We had so much stuff in our house. Moving forced us to get rid of it and leave behind the things we never used. Even the kids gave away a lot of their toys. And guess what. We hardly even remember what we gave away! 5. We’re not as indispensable as we think we are. I loved my job in Ohio. I knew I did it well, and I was proud that I could pierce ears and help manage that store, but now that I’m gone someone else does that job. Almost all of the people I knew there have moved on to other jobs in other places, and nobody there even knows who I am. And I’m OK with that. This time, the change was good, and we all survived. Even the hermit crab! I grew up in Indiana, so I’m no stranger to tornado weather. The secretary at the elementary school I attended used to run through the building blowing a whistle as loudly as possible during severe weather to alert us of impending doom. Then, of course, everyone hurried to the lower levels of the building and assumed The Tornado Crouch: kneeling with hands on the back of the neck, fingers intertwined, face inches from the floor. If you grew up in the midwest, you know the drill. Most of those tornado scares amounted to just a lot of sitting on the floor in near silence listening for the sound of a freight train (whatever that sounds like!). For the most part, life went on pretty much as usual. It sometimes felt like the weathermen overreacted. OK, the school secretary did NOT look this young and beautiful, but she might have had this expression when she ordered us all downstairs for the tornado drills. When we moved to the Great Plains, I assumed that thunderstorms and tornado warnings/watches would be the same here as back East. I mean, we read statistics about tornados and how often they hit this area, but I also heard those types of statistics about tornados in Indiana as a child. So we were nonchalant. But then we noticed something. We noticed that when the weatherman predicted thunderstorms, things like youth group events and church meetings got cancelled. 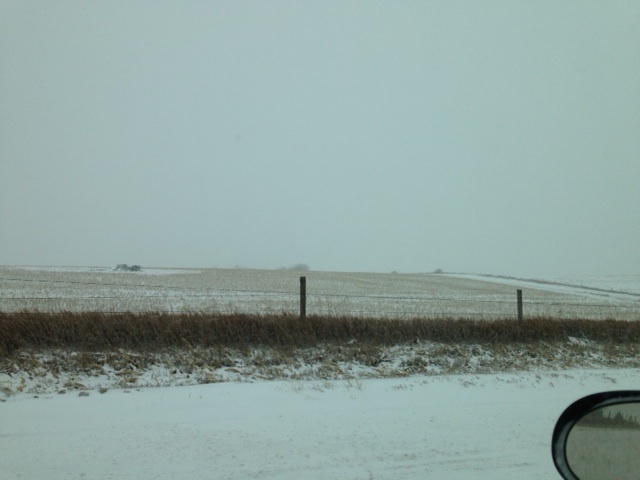 We saw our neighbors scurry home to beat the weather, and we started thinking that if the native Nebraskans were worried, maybe we should be, too. 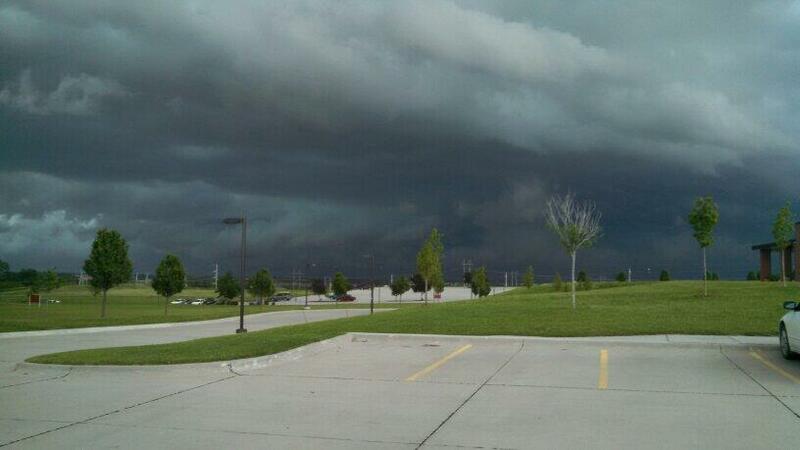 This was taken in Omaha, just north of where we live. Looks like something from the Left Behind series. 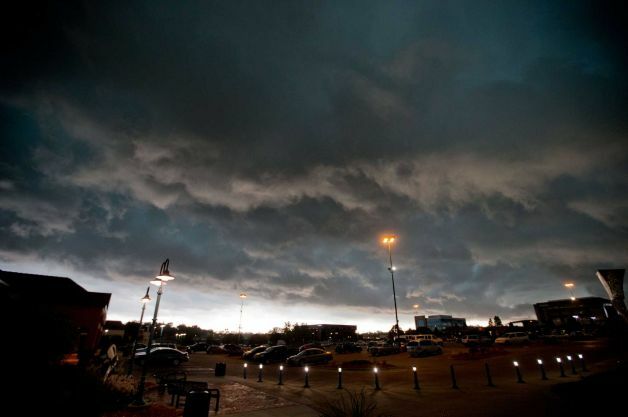 Then yesterday the weather service predicted severe thunderstorms: the kind that produce tornados. We heard that planes at the nearby Air Force base evacuated to other states in anticipation of the storm and that those working on base were sent home “to prepare”. 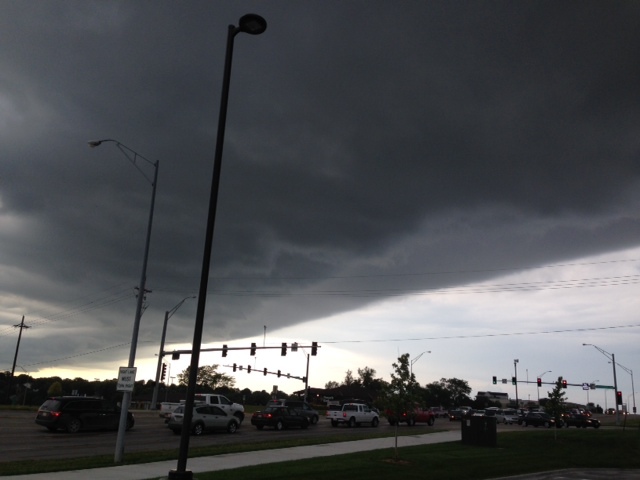 Pictures of radars and storm clouds popped up all over social media. 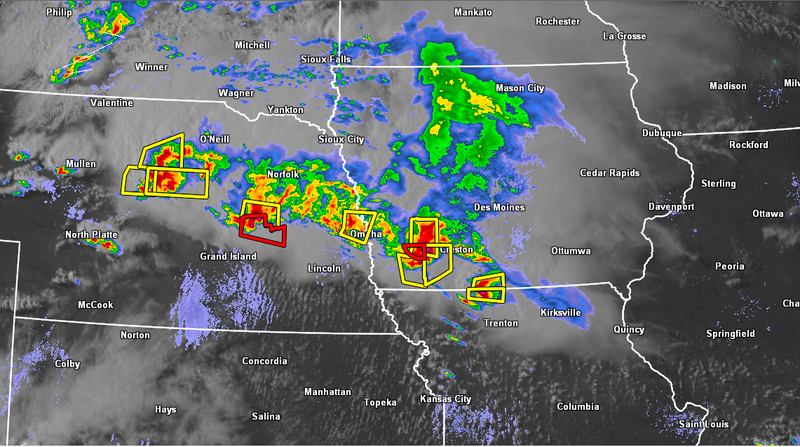 We are at the bottom of the yellow box, near Omaha. The weather guy said they describe these storms as train cars because one rolls in just as the last storm cell rolls out. 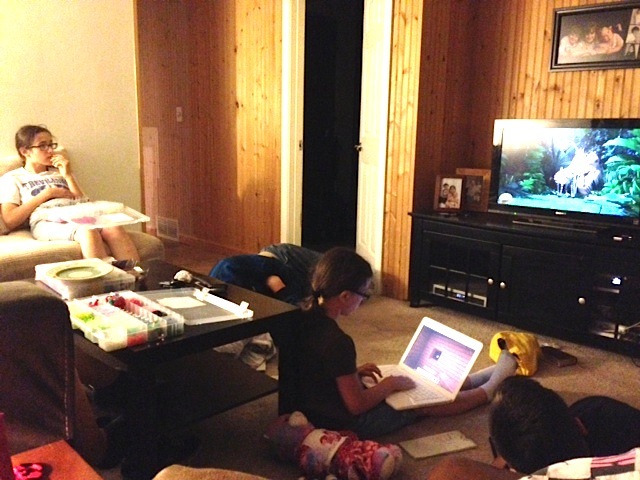 We holed ourselves up in the basement and watched Madagascar. We wanted to watch Twister, but our internet did not cooperate. We did what good Nebraskans should do. We cancelled piano lessons and ordered a pizza. Oh, and we invited friends who don’t have a basement over to share the pizza and have the first ever in the history of our family Storm Party. 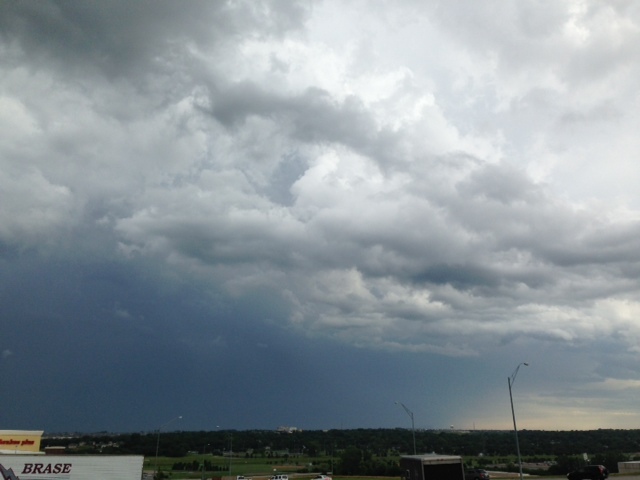 At about 11 pm, our guests and I crept outside to look at the storm. From the shelter of the back porch, we watched lighting streak across the whole sky. Thunder boomed, and rain poured. We looked at the trees, though, and realized that there was no wind at all. Just a regular thunderstorm. We went to bed. This is the parking lot at work. No, it’s not normally that dark and brooding! In the morning, I woke and realized we made it through the night fine. Our neighborhood sustained no damage at all. I saw no downed limbs or fallen trees. No power outages. Just life as usual. I started to think the weathermen overreact everywhere, but then I saw pictures from North Omaha and a town called Blair just about 45 minutes northeast of Omaha. Might be a good time to buy a new car if you live in Blair. That is, as long as you don’t mind a few dings here and there. Or maybe a broken window. 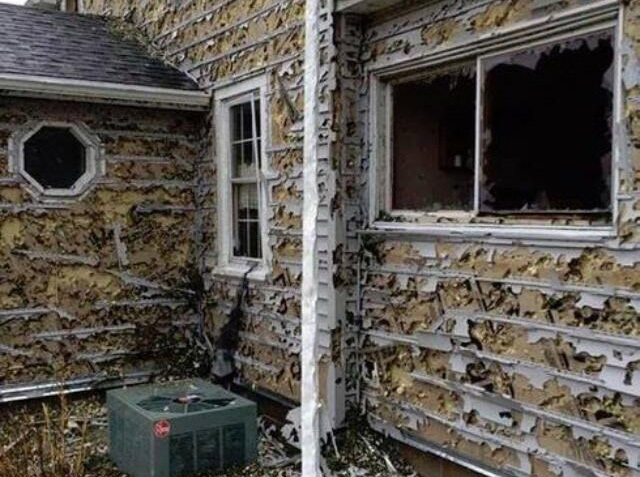 Looks like maybe this house in Blair saw some hail last night…you know, just a little. I guess when it comes down to it, a few miles can make all the difference! At this point, I’ve decided that following the lead of the neighbors and listening to the weather report may be a good idea. 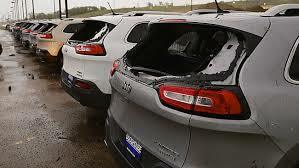 Even though this damage happened about an hour from our house, it could have easily been us. Thank goodness the most excitement we saw was when the pizza man arrived!